Damage to the ankle ligaments or bone is a common reason for foot pain. 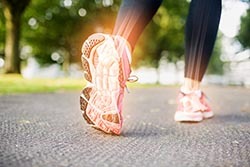 Foot pain is an extremely common injury among athletes, especially those who play sports that involve a lot of running, jumping and/or quick changes of direction. Foot pain is any type of discomfort that is felt in one or both feet. Among athletes, sports injuries to the ankle ligaments or bone is a common reason for foot pain. Ankle ligaments can be damaged during an abnormal motion while playing sports, training or walking. Damage to the ankle bones is typically the result of an impact injury, such as colliding with an object or another person. Other causes include Achilles tendinitis, bunions, broken or bruised toe, flat feet, septic arthritis or tumors. What are the symptoms of foot pain? The most common symptom is an uncomfortable feeling or pain around the ankle, toes or the entire foot. Such pain is often accompanied by swelling and/or tenderness when touching the foot. The pain associated with a foot injury is typically proportional to the severity of the injury. For instance, a small ligament tear will cause much less pain than a complete tear or a broken bone in the foot. What is the treatment for foot pain? When an athlete experiences pain, it is vital to seek professional sports medicine help right away. A sports medicine doctor can properly diagnose the condition and recommend an appropriate course of treatment. Athletes are encouraged to contact Dr. Bob Meyer at the Spinal Rehab and Sports Medicine clinic today. Dr. Bob will perform tests, such as an x-ray or CT scan, to determine the extent of damage to the foot. He will then recommend the best course of sports injury treatment. Injuries to the foot are commonly treated using EPAT Laser Pulse Therapy to help you quickly recover from your injury.